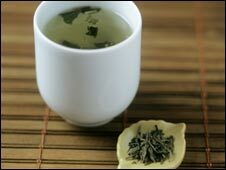 A chemical found in green tea appears to slow the progression of prostate cancer, a study has suggested. Green tea has been linked to a positive effect on a wide range of conditions, including heart disease, cancer and Alzheimer's disease. The research, in the US journal Cancer Prevention Research, found a significant fall in certain markers which indicate cancer development. A UK charity said the tea might help men manage low-risk tumours. Although previous studies have shown benefits from drinking green tea - including some positive findings in relation to prostate cancer, there have been mixed results. In this study, Philadelphia-based researchers tested a compound called Polyphenon E.
They were looking for a number of biomarkers - molecules - including vascular endothelial growth factor (VEGF) and hepatocyte growth factor (HGF) which are indicators of developing cancer. They also looked for prostate specific antigen (PSA) - a protein only found in the prostate. Levels can rise if cancer is present. The study included 26 men, aged 41 to 72 years, who had been diagnosed with prostate cancer and who were scheduled for radical prostate surgery. Patients took four capsules containing Polyphenon E for an average of 34 days, up until the day before surgery - the equivalent of around 12 cups of normally brewed concentrated green tea. The study found a significant reduction in levels of HGF, VEGF and PSA, with some patients demonstrating reductions of more than 30%. Dr James Cardelli, from the Feist-Weiller Cancer Center, who led the study, said the compound, which was provided by the company Polyphenon Pharma, "may have the potential to lower the incidence and slow the progression of prostate cancer." There were only a few reported side effects associated with this study, and liver function remained normal. Dr Cardelli said: "We think that the use of tea polyphenols alone or in combination with other compounds currently used for cancer therapy should be explored as an approach to prevent cancer progression and recurrence." "There is reasonably good evidence that many cancers are preventable, and our studies using plant-derived substances support the idea that plant compounds found in a healthy diet can play a role in preventing cancer development and progression." John Neate, chief executive of the Prostate Cancer Charity, said: "There have been several studies into green tea and its potential benefits, but there is, as yet, no conclusive evidence. "The results of this study do suggest that there is merit in further research into the effects of extracts of green tea, both in relation to its impact on the prevention of prostate cancer and in controlling progression in men already diagnosed with the disease, as was investigated in this instance." "These initial positive findings could indicate that green tea could have a place in 'active surveillance', where a slow-growing, low risk tumour is monitored for changes and men want to take something which could help keep progression at bay. "Potentially, this could mean completely avoiding, in some cases, any of the more usual medical interventions and their associated side effects."